Careers in Manufacturing: Your choice!! Your future!! The Miami County Economic Development Authority welcomes you to Miami County Indiana, North Central Indiana's optimal location for new and existing business. Some advantages to Miami County include a diverse economic base, low cost of living, quality of life, and location in the heart of the midwest. US Highway 31 and US Highway 24 cross in the center of Miami County providing boundless opportunity for existing and prospective businesses. Join us in exploring the Miami County advantage through the pages on this site. Enjoy your review of our great community and please feel free to contact us at any time. The Grissom Air Reserve Base (ARB) Joint Land Use Study (JLUS) is a community driven, cooperative, strategic planning effort between Grissom ARB, the surrounding local jurisdictions, and local community stakeholders. The JLUS will identify means of promoting land use, urban growth, and economic development that is compatible with the mission of the 434th Air Refueling Wing (434 ARW). Additionally, the JLUS will seek ways to reduce the military operational impacts on adjacent lands, protect the health and safety of the surrounding population, and maximize compatible economic development potential of the Grissom Aeroplex. Click here for more information and Study updates. We just may be the missing piece to your client's puzzle." 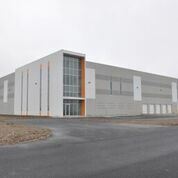 A new Shell Building is located in the South Industrial Park at Grissom Aeroplex in Miami County. It is 57,600 sq. ft. expandable to 240,000 sq. ft. The building features 32 ft. clear ceiling height and 80 x 30 column spacing. It is a concrete tilt up on the north and east side with structural steel on the south and west sides. 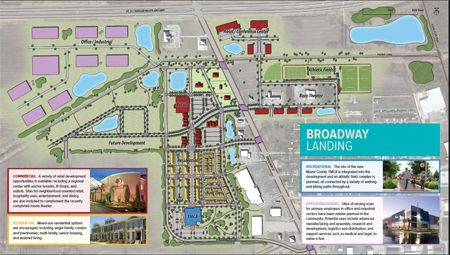 Building and business park are adjacent to US 31, a major north/south 4 lane highway which connects to six different interstates within an hours drive. The building and park are also adjacent to a 12,500 ft. aircraft runway offering access to cargo and corporate aircraft. The shell building is owned by Miami County Economic Development Authority.